We are pleased to present the following guest post from Anne Keeling, who handles media relations and marketing for The International School Consultancy (ISC), a marketing intelligence and research firm focused on international English-speaking schools. The efforts of higher education institutions to reach out to students from overseas are greater than they’ve ever been, and there’s a good reason. The number of internationally mobile students has now reached five million, and every year more international students are seeking university options abroad. The market is growing – and the number of institutions marketing to them is growing too. The 2014 Universities UK report: International students in higher education: the UK and its competition said that, “International higher education is an increasingly competitive market…with governments implementing bold strategies in an attempt to attract more international students to their own universities.” And an education report published by the US International Trade Administration (ITA) in July this year addressed the issue of global competition for international students, highlighting the fact that competition is no longer coming solely from higher education institutions in English-speaking countries. The report stated that a growing number of non-English-speaking countries are increasing their English-taught programme offerings, adding that, although the US still hosts the largest number of international students of any global study destination, its share is eroding as the competition expands. “Attracting the best students from around the world has become a large and growing global export opportunity,” said the report. Higher education institutions should not only be aiming to recruit enough international students, but also the right students; not only academically, but socially and with adequate language skills too, so that they will thrive during their higher education experience. China, India, South Korea, and Saudi Arabia are considered high potential sources for international students (according to the US ITA education report), but finding the right students in these, and other countries, is a common challenge for enrolment managers of western universities. Tao Sun, chairman of HD Ningbo School in Zhejiang, China provides a good explanation why: “We have seen a lot of stories recently of Chinese students who, even if they can get to the top western universities, after the first year many fail to continue their studies because either they fail in their exams or there is too much pressure to be competitive,” he says. International student recruitment, therefore, should aim to identify schools that are consistently producing students who are not only academically able, but also socially adaptable, competent speakers of English, and who will thrive in the environment of a western university. 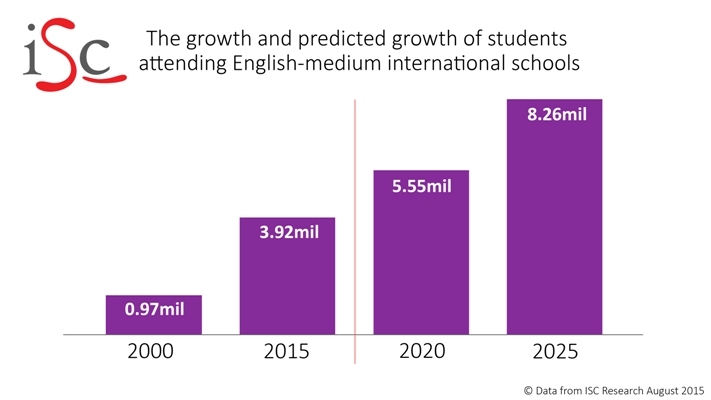 A sector consistently producing such students is the world’s English-medium K-12 international schools market. Not only is it a market that’s proving itself as a reliable source, but it is a vastly expanding sector too – for just that reason. In just five years, the number of students attending K-12 international schools around the world has increased from 2.5 million students in 2010 to 4.2 million students today. ISC Research, part of The International School Consultancy (ISC), the leading provider of data and intelligence on this market, predicts the number of students attending international schools will increase to 8.26 million by 2025. The reason for this phenomenal growth is that most major cities in the world today have at least one, if not many international schools, and they are considered an effective route to western universities. 80% of students attending international schools today are children of wealthy local families who have made the school selection in order to increase their child’s chances of gaining a place at university abroad. Curriculum and examinations at such schools are internationally recognised (in the most part studying towards Advanced Placement, International Baccalaureate Diploma Programme or A levels). Their western-style learning approach focuses on the development of skills as well as knowledge, and prepares students for the independent learning requirements of western universities. And, in the most part, from the early years onwards, students at international schools learn all their subjects in the language of English; speaking and applying it within all that they do, resulting in fluent English-language speakers. In addition, the vast majority of international school students are aspiring to higher education. In an ISC Research survey of international school college counsellors conducted this summer, 80% of all counsellors who responded said that over 95% of students at their school hope to progress to university or college. The college counsellor at the International School of Bremen in Germany, Sabine Keeley, says that most of the school’s students move on to university in the UK, the US, the Netherlands and, increasingly, private universities in Germany that offer English speaking courses. “International students have so much to offer universities,” she says. Ms Keeley knows exactly what she and her students need in order to make informed choices about higher education. “I do get lots of brochures and pamphlets from universities, but it doesn’t replace direct contact with the enrolment staff. A connection between a school and a university is important as it then puts that university on the student’s radar,” she says. Liz Green, an international officer at The University of Manchester in England, where 25% of all students are international, explains how the university reaches out to international schools: “We have good relationships with many international schools in Malaysia, Singapore, and Hong Kong, where we’ve been building relationships for many years. This has involved regular visits to the schools from both our recruitment and academic staff. The university reaches out to international schools in other ways too, such as e-newsletters for international school college counsellors which share advice on such details as how to help students with their UCAS and visa applications, and information about studying subjects such as management, law, psychology, and engineering in the UK. At small, liberal arts college, John Cabot University in Rome, Italy, international school students are considered ideal candidates too. The enrolment team at John Cabot targets specific international schools that offer the International Baccalaureate, Advanced Placement or A-level qualifications and that are within a three-hour plane journey of Rome. “Parents do want their children to be fairly accessible,” explains Danette Anderson, director of marketing and enrolment. As Ms Keeley noted, international school counsellors are eager to work with universities and a number of schools have forged long-standing and highly successful relationships that result in a constant flow of students applying to particular establishments. The language of learning and communicating at international schools is English so your marketing materials and messages should be in English. But remember that parents of international students may not be English speakers and multi-language support material for parents may be beneficial and appreciated. Establish a relationship with the college or career counsellor at the school. That person will help you to connect with all the students who are considering higher education within the school. These counsellors welcome information about the individual universities and want to remain updated on practical country-specific advice regarding such issues as application processes and visas. Many of the students at international schools don’t come from the UK or the US, or the destination of the universities they are considering, so it’s a very new and unknown environment they’re facing. Much of the university information they will gather will be from their career counsellors. This is why relationship building and good communication with the counsellors is so important. Visits to targeted international schools by a university representative are very important as they start a connection between the school and the university. Direct personal contact between a university and the school career counsellor can make a real difference towards effective and sustained marketing of your university. Students in their final two years of high school are incredibly busy studying and so need to be efficient in the time they spend selecting their university options. International schools will appreciate a collective approach when it comes to school visits; where representatives from several universities come together for a tour or to participate in a university fair to maximise student, and counsellors’ time. The Council of International Schools hosts organised student recruitment tours to various regions of the world each year for higher education institutions to meet with international school students. Most of the leading international schools employ experienced career counsellors and these schools are very selective with any external agents or university subcontractors they might use; only working with trusted individuals or reputable organisations. Some schools refuse to work with agents or subcontractors, preferring to work directly with the universities. Some schools ban their students from working with agents without prior vetting by the school. There are exceptions, such as when students wish to go to university in a destination with very specific requirements, such as South Korea, and where hiring a private counsellor with specific country knowledge may be valuable. Some university enrolment managers are still lacking in their knowledge of the International Baccalaureate Diploma Programme (IBDP), particularly some in the UK where the IBDP is still gaining recognition. For universities that want to work closely with international schools, acquiring a very clear understanding of all the examinations offered is important. Clear messages about the university, its ethos, size, location, international student support, and academic and extra-curricular offerings are important. Sharing direct links to special international student pages of your website will help international school career counsellors and students to find the information that helps them make an informed choice. International students often cannot attend university open days because of the travel distance and cost. Careers counsellors at international schools urge universities to feature video tours of the campus online. Short video sessions featured online from select departments are also helpful – especially those departments that set the university apart from others, so that students can decide what course choice is right for them. A significant number of students will follow where their older school colleagues have gone, particularly if the match has been successful and the experience has been very positive. This is why relationship building with the right schools is so worthwhile. Finally, two ISC seminars for higher education representatives wishing to work with international schools will take place this year in the UK. For further advice about working with international schools, please contact ISC Business Development Manager Diane Glass. This entry was posted in Africa, Agents, Asia, Australia/Oceania, Canada, China, Europe, Germany, Higher Education, Italy, K-12, Middle East, North America, Regions, South & Central America, South Korea, United Kingdom and tagged colleges with international students, recruiting expat students, language schools, international students, student recruitment.